Pierre-Yves Toullelan, 1984, Tahiti colonial (1860-1914). / : [Anmelder] Robineau Claude. I: Journal de la Société des océanistes, Année 1992, Volume 95, Numéro 2 p. 279 - 280. Mururoa og Fangataufaøerne var stedet for omfattende franske atomvåbenforsøg under og efter den kolde krig, 1966-1996. Oplysninger om kernevåbenforsøgene er stadig skjulte som klassificeret eller maskeret information. History: Mururoa and Fangataufa Islands was the site of extensive French nuclear weapons tests during and after the Cold War, 1966-1996. Information on the nuclear weapons tests are still hidden or masked as classified information. The main work in Danish about French Polynesia and its history since the 1960s, primarily in the light of the French nuclear tests with their environmental and health consequences for the population in the area, as well as on the long-running battle both for independence and the cessation of nuclear tests is the Poisoned Paradise or Poisoned Reign: French Nuclear Colonization in the Pacific . / Bengt Danielsson & Marie-Therese Danielsson and with a foreword by Ib Michael. Klim. 1990th - 420 p The book is a continuation of Moruroa, Mon Amour: The French Nuclear Tests in the Pacific Penguin Books, 1977. Bengt Danielsson interviewed by Hazel de Berg in the Hazel de Berg collection [sound recording]. Les principaux travaux en danois à propos de la Polynésie française et de son histoire depuis les années 1960, principalement à la lumière des essais nucléaires français avec leurs conséquences sur l'environnement et la santé de la population dans la région, ainsi que sur la bataille de longue haleine à la fois pour l'indépendance et la cessation des essais nucléaires est Moruroa notre bombe coloniale. / Bengt Danielsson & Marie-Thérèse Danielsson. 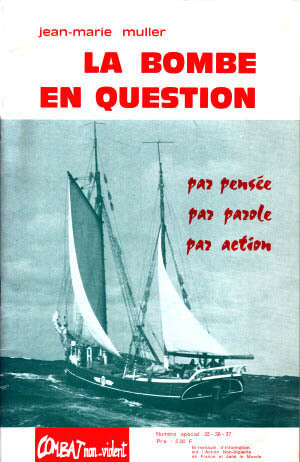 Ce livre est la suite de Moruroa, Mon Amour: Les essais nucléaires français dans le Pacifique Paris, 1974. Assemblée de la Polynésie francaise: Les Polynésie et les essais nucléaires : Indépendance nationale et dépendance polynésienne. / : Rapport de la Commission d’enquête de l’APF sur les essais nucléaires aériens, Papeete: 2006. - 334 s. Online. Ceci est un bref résumé du rapport. Afghansk historie ; Albansk historie ; Algerisk historie ; Andorras historie ; Angolas historie ; Antigua & Barbudas historie ; Argentinsk historie ; Armensk historie ; Aserbajdsjans historie ; Australsk historie ; Bahamaøernes historie ; Bahrainsk historie ; Bangladesh historie ; Barbados historie ; Belgisk historie ; Belizes historie ; Benins historie ; Bhutans historie ; Boliviansk historie ; Bosnien-Hercegovinas historie ; Botswanansk historie ; Brasiliansk historie ; Britisk historie ; Britiske kolonier, mandatområder og protektorater ; Brunei Darussalamsk historie ; Bulgarsk historie ; Burkina Fasos historie ; Burundis historie ; Canadisk historie ; Cambodjansk historie ; Camerouns historie ; Centralafrikansk historie ; Chilensk historie ; Colombiansk historie ; Comorernes historie ; Congolesisk historie ; Costa Ricansk historie ; Cubansk historie ; Cypriotisk historie ; Dansk historie ; Dansk historisk bibliografi ; Den demokratiske republik Congos historie ; Djiboutis historie ; Dominicas historie ; Den dominikanske republiks historie ; Ecuadoriansk historie ; Egyptisk historie ; El Salvadoransk historie ; Elfenbenskystens historie ; Eritreas historie ; Estlands historie ; Etiopisk historie ; Fijis historie ; Filippinsk historie ; Finsk historie ; De forenede arabiske Emiraters historie ; Fransk historie ; Færøsk historie ; Gabons historie ; Gambiansk historie ; Georgiens historie ; Ghanas historie ; Grenadas historie ; Græsk historie ; Grønlandsk historie ; Guatemalas historie ; Guineas historie ; Guinea-Bissaus historie ; Guyanas historie ; Haitiansk historie ; Honduransk historie ; Hollansk historie ; Hvideruslands historie ; Indisk historie ; Indonesisk historie ; Iraks historie ; Iransk historie ; Islandsk historie ; Irsk historie ; Israelsk historie ; Italiensk historie ; Jamaicas historie ; Japansk historie ; Jordans historie ; Kap Verdisk historie ; Kasakhstanisk historie ; Kenyansk historie ; Kinesisk historie ; Kirgisistans historie ; Kiribatis historie ; Kosovoansk historie ; Kroatiens historie ; Kuwaits historie ; Laotisk historie ; Lesothisk historie ; Letlandsk historie ; Libanesisk historie ; Liberias historie ; Libysk historie ; Liechtensteins historie ; Litauens historie ; Luxembourgs historie ; Madagascars historie ; Makedonsk historie ; Malawis historie ; Malaysiansk historie ; Maldiviensk historie ; Malis historie ; Maltesisk historie ; Marokkansk historie ; Marshalløernes historie ; Mauretaniens historie ; Mauritiusk historie ; Mexicansk historie ; Mikronesisk historie ; Moldovisk historie ; Monacos historie ; Mongoliets historie ; Montenegros historie ; Mozambiques historie ; Myanmars historie ; Namibias historie ; Naurus historie ; Nepals historie ; New Zealandsk historie ; Nicaraguas historie ; Nigers historie ; Nigerias historie ; Norsk historie ; Nordkoreansk historie ; Omans historie ; Pakistansk historie ; Palaus historie ; Palæstinas historie ; Panamansk historie ; Papua Ny Guineas historie ; Paraguays historie ; Peruviansk historie ; Polsk historie ; Portugisisk historie ; Qatars historie ; Rumænsk historie ; Russisk historie ; Rwandas historie ; Salomonøernes historie ; Samoas historie ; San Marinos historie ; São Tomé & Principles historie ; Saudi-Arabisk historie ; Schweizisk historie ; Senegals historie ; Serbisk historie ; Seychellernes historie ; Sierra Leones historie ; Singapores historie ; Skotsk historie ; Slovakiets historie ; Sloveniens historie ; Somalisk historie ; Spansk historie ; Sri Lankas historie ; St. Kitts & Nevis historie ; St. Lucias historie ; St. Vincent & Grenadinernes historie ; Sudanesisk historie ; Surinams historie ; Svensk historie ; Swazilands historie ; Sydafrikansk historie ; Sydkoreansk historie ; Sydsudans historie ; Syrisk historie ; Tadsjikistansk historie ; Taiwanesisk historie ; Tanzaniansk historie ; Tchads historie ; Thailandsk historie ; Tjekkisk historie ; Togos historie ; Tongas historie ; Trinidad & Tobagos historie ; Tunesisk historie ; Turkmenistansk historie ; Tuvalus historie ; Tyrksk historie ; Tysk historie ; Ugandas historie ; Ukrainsk historie ; Ungarns historie ; Uruguays historie ; USAs historie ; Usbekistans historie ; Vanuatus historie ; Venezuelas historie ; Vietnamesisk historie ; Yemens historie ; Zambias historie ; Zimbabweansk historie ; Ækvatorial Guineas historie ; Østrisk historie ; Østtimorsk historie. The humanitarian impact and implications of nuclear test explosions in the Pacific region. / : Tilman A. Ruff. International Review of the Red Cross (2015), 97 (899), 775–813. French nuclear tests 'showered vast area of Polynesia with radioactivity' : Declassified papers show extent of plutonium fall-out from South Pacific tests of 60s and 70s was kept hidden, says French paper. Encouraging the peace process in Sri Lanka and expressing the sense of Congress that the United States should recognize the concerns of the peoples of Oceania and call upon the government of France to cease all nuclear testing at the Moruroa and Fanataufa Atolls : markup before the Committee on International Relations, House of Representatives, One Hundred Fourth Congress, first session, on H. Res. 181 and H. Con. Res. 80, July 26, 1995 (1995). - 30 s.